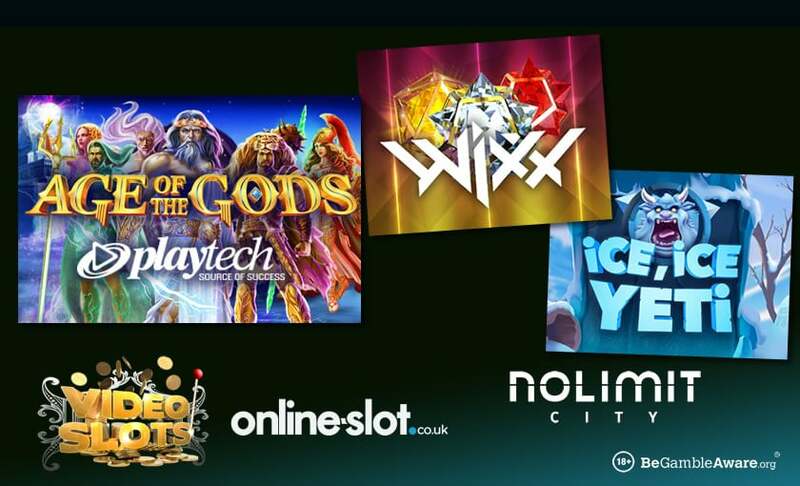 Videoslots Casino continues to expand their slots portfolio for UK players with the introduction of Age of the Gods from Playtech and all titles from Nolimit City. Age of the Gods is the best Age of the Gods series slot by Playtech and has 5 reels and 20 paylines. Featuring Zeus, Poseidon, Hercules and Athena, it comes with a Pantheon of Power On Reels feature where all 5 gods appear to reward you with a cash prize. However, it’s all about the Age of the Gods Bonus feature where you can play 4 free spins features again and again. Athena gives you random multipliers up to 5x with Zeus gives you an increased multiplier after every 3 free spins. Hercules gives you a stacked wild and Poseidon sees up to 5 wilds added on each free spin – the latter can give you payouts of up to 7,000 times your stake on each of free spin! There’s also 4 progressive jackpots up for grabs with the Ultimate Power Jackpot worth over £540,000. Nolimit City is an up and coming software provider which we have reviewed here at Online-Slot.co.uk. With great concepts and innovative themes and mechanics, they release new slots regularly and will only grow in popularity. Here’s 2 of our favourites. Ice Ice Yeti takes you a frozen wilderness and has 5 reels and up to 16,807 ways to win. There’s a Yeti Shake feature where the Yeti shakes the reels and thaws reel positions to give you more ways to win. The Ice Ice Respins feature sees you get respins with unfrozen positions – if a sticky symbol lands, you’ll get streak respins which continue or more matching/wild symbols land. There are payouts of up to 8,820 times your stake on offer. Wixx is a futuristic looking game with 4 reels and 81 ways to win. If you get a 4 of a king ruby win, the Ruby Booster Re-spin feature is played where rubies transform into wilds. You can also benefit from 5x multipliers, respins with stacked sapphires, rubies turning wild and crystal wins subject to a 5x multiplier, stacked rubies, sapphires and wilds and all gems being stacked and with a 5x multiplier. You can win up to 2,796 times your stake on every respin too. Videoslots Casino has more than 3,400 slots! With the largest selection in the world, they truly have everything you will ever need. With 24/7 customer support, cashouts within minutes and numerous industry awards under their belt, you are in the best hands. Sign up to get a 100% bonus up to £200 as well as 11 wager-free welcome spins and £10 extra cash.